Sainte-Chapelle is a chapel on the Ile de la Cite in Paris. Sainte-Chapelle is a chapel in the royal palace on the Ile de la Cite in Paris. Most of the unique coloured glasses are authentic. 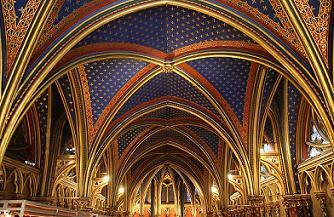 Sainte Chapelle has been a national historic monument since 1862. Ile de la Cite is an island in the Seine river in the center of Paris. The Notre Dame cathedral is also on Ile de la Cite. Between Sainte Chapelle and the Notre Dame are several other famous buildings such as Palais de Justice and the oldest hospital of Paris ‘Hotel-Dieu’. Hotel Albe Saint Michel has a very central location; it’s only 5 minutes walking to the Notre-Dame Cathedral. Metro station Saint-Michel is 200 metres from the hotel. Apartments Citadines Saint-Germain-des-Prés Paris are also nearby cathedral the Notre-Dame. The studio’s can sleep two persons and includes a full kitchen with dishwasher, satellite TV, free Wi-Fi access and a bathroom with bathtub. The apartments have a size of 38m2 with a doublebed and a sofabed. It’s very easy to reach Sainte-Chapelle. Metro station Cite is 100 metres away and metro station Saint-Michel 300 metres.